Public Enterprise is a double blind peer-reviewed journal (ISSN 0351-3564), (DOI:10.21571/pehyj) published twice a year by International Center for Promotion of Enterprises that aims to disseminate high quality scholarly research and add to the pool of knowledge on the subject of public enterprise by publishing theoretical and empirical academic articles in the field of governance of public enterprises. The regular issues give priority to the topics related to performance measurement, management and monitoring systems, restructuring and privatisation, corporate policy development, comparisons with the private sector and the third sector, public policy relating to the public sector, corporate social responsibility and sustainability. The Journal welcomes both theoretical and applied research materials. Author Guidelines are available HERE. 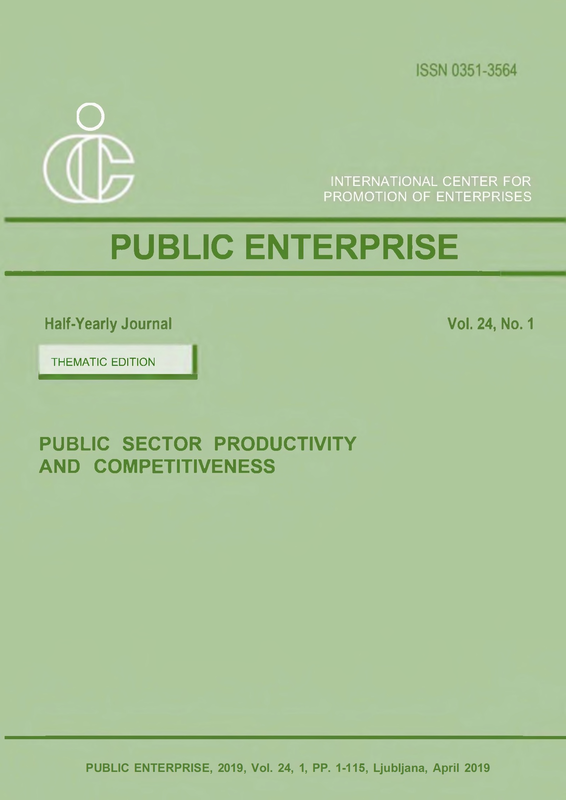 This Special Issue of Public Enterprise on Public Sector Productivity and Competitiveness includes five research articles by authors from Austria, India, Peru, the United Kingdom and the United States. The topics addressed in this issue relate to disinvestment (privatization), performance contracts, public sector restructuring, and public reform; city planning, urban economics, and urban competitiveness; sustainable land management and national competitiveness; productivity, market competitiveness, and strategic management; and public sector productivity measurement. Available for download free for a limited time. 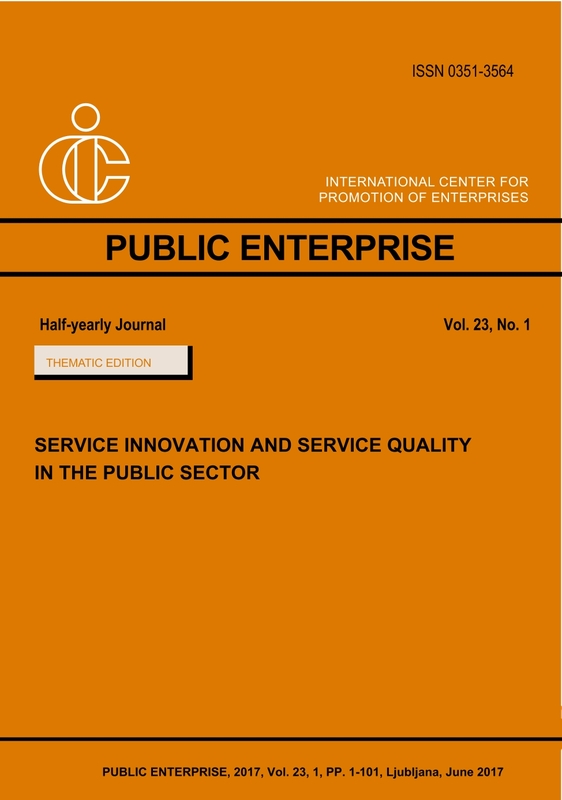 This Special Issue on Service Innovation and Service Quality in the Public Sector of Public Enterprise Half-Yearly Journal includes five research articles by authors from India, Peru, and the United Arab Emirates. It spans a spectrum of research areas such as private and government hospitals; hospitality sector and tourism; private equity innovation management and innovation standards; valuation, and investment; and human values-based service quality and innovation. 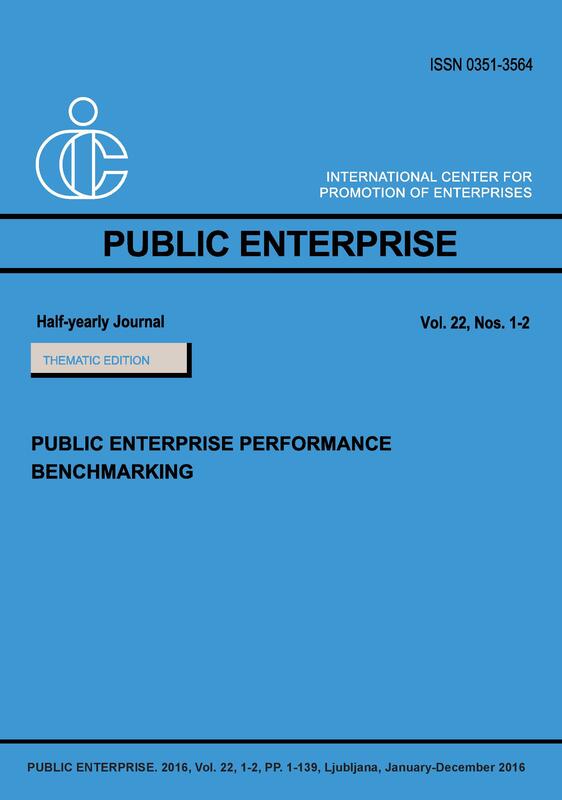 This Special Issue on Public Enterprise Performance Benchmarking of Public Enterprise Half-Yearly Journal includes seven research articles by authors from Argentina, India, Pakistan, Peru, Singapore, the UK, and USA. It spans a spectrum of research areas such as national competitiveness and economic growth, efficiency of public water companies, international trade, travel and tourism industry, operating and financial leverage and the systematic risk of enterprises, performance evaluation systems and operational efficiency,and efficiency of public banks. The thematic issue of the ICPE Public Enterprise Quarterly Journal entitled “Implementing Economic Diplomacy and Internationalization” contains the proceedings of the 3rd International Conference on Economic Diplomacy and Internationalization organized by ICPE in partnership with the Ministry of Foreign Affairs of Bosnia and Herzegovina and the Foreign Trade Chamber of Bosnia and Herzegovina in cooperation with the Ministry of Foreign Affairs of the Republic of Slovenia. The conference was held in Sarajevo (Bosnia and Herzegovina) on 2-3 June 2014. The publication offers a wide range of approaches to economic diplomacy and internationalization implemented in various geographical and economic contexts and at the same time focusing both on practical as well as theoretical aspects. The authors of the articles in this volume are high profile experts from Bosnia and Herzegovina, Slovenia and foreign national institutions, representatives of the diplomatic corps, international organizations, business and academia. 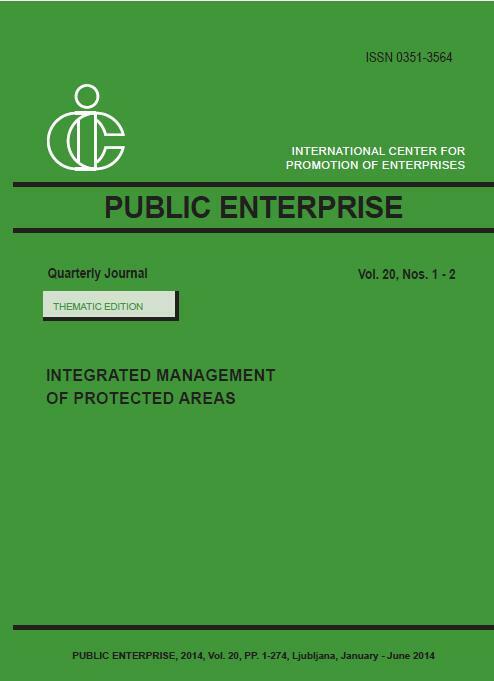 The thematic issue of the ICPE Public Enterprise Quarterly Journal bearing the title »Integrated Management of Protected Areas« has been recently published in cooperation with the Association of Nature Parks of the Republic of Slovenia. The publication offers a comprehensive background documentation for assisting ICPE member countries and interested partners in their efforts to find and develop adequate solutions for the establishment and integrated management of protected nature areas, as a tool for protecting and safeguarding biotic diversity and for ensuring that economic growth goes hand in hand with the need to protect and restore valuable natural heritage. 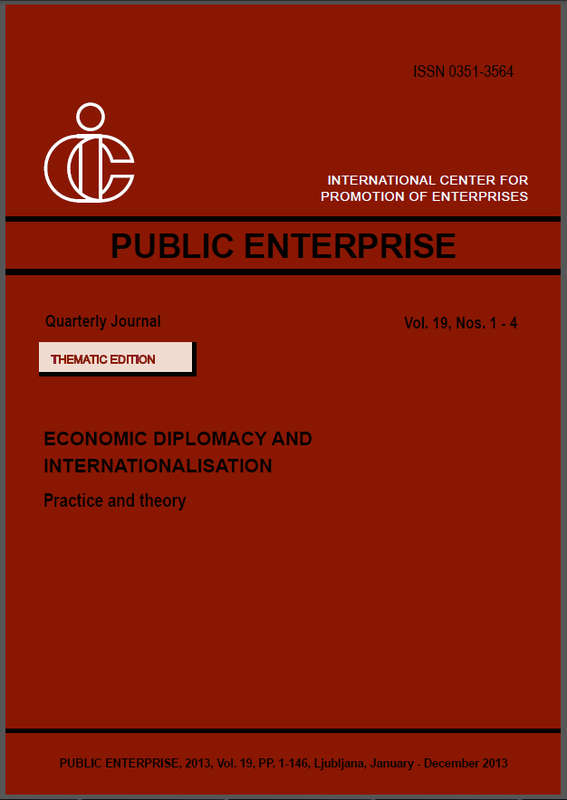 The thematic issue of the ICPE Public Enterprise Quarterly Journal bearing the title “Economic Diplomacy and Internationalization – Practice and Theory” contains the proceedings of the 2nd International Conference on Economic Diplomacy and Internationalization organized by ICPE which was held in Ljubljana (Slovenia) on 17-18 June 2013. The authors of the articles in this volume are high profile experts from Slovenia and foreign national institutions, representatives of the diplomatic corps, international organizations, business and academia who shared their vast knowledge, expertise and insights regarding economic diplomacy and facing internationalization. 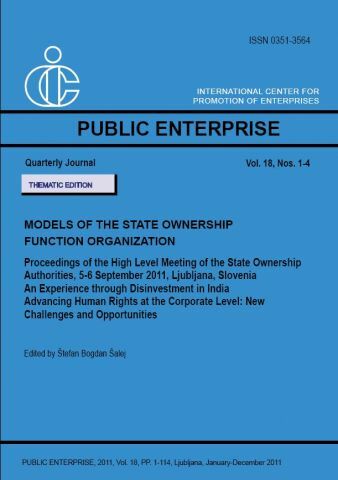 The papers contained in the thematic issue of the ICPE Public Enterprise Quarterly Journal “Models of the State Ownership Function Organization” are based on the selected presentations delivered during the High Level Meeting of the State Ownership Authorities “State as an owner – ownership policy, execution of state interests and fostering of public-private dialogue” that was organized by ICPE in Ljubljana (Slovenia) on 5-6 September 2011. The articles of high-profile experts from Asia, Africa, Latin America and Europe and international organizations present different models of organization of the state ownership function and different philosophies regarding the role of public sector enterprises in the national economy. 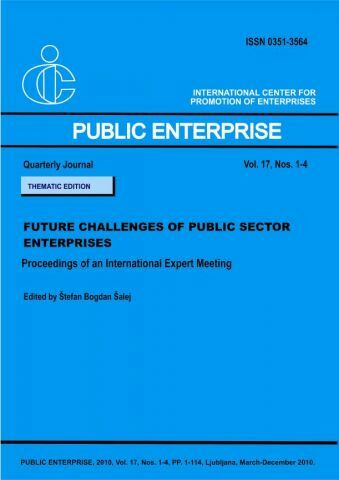 The thematic edition of the ICPE Public Enterprise Journal is comprised of the proceedings of the international expert meeting “Future Challenges of Public Sector Enterprises” organized by ICPE on 8 November 2010 in Ljubljana (Slovenia). The contributions of authors from Asia, Africa, Latin America and Europe, as well as international organizations representatives offer an insight into the future challenges of public sector enterprises. The articles tackle the importance of the public-private dialogue for overcoming the difficulties raising from the economic, public and political nature of PSE activities, analyze the PSE corporate governance and social responsibility policy frameworks aiming to identify best PSE practices as benchmarks for evaluation and the positioning of public sector enterprises as one of the tools leading to global welfare and human development improvement in the new economic and social framework. Click on the cover to read the Public Enterprise Journal, Vol. 17 - 21. The Hungarian Privatization and State Holdings Co.